Do more than assemblies - run a comprehensive school wide anti bullying campaign! Keith’s assemblies have a positive effect on school culture, however, the impact of running an anti bullying campaign by combining Keith’s live assemblies, teacher workshops, parent workshops, and curriculum has proven to be extraordinary. Check out the demos for Keith’s assemblies and then bounce down and learn how you can combine Keith’s assemblies with his curriculum to create a powerful anti bullying campaign. 10 Anti Bullying Serious Comedy Clips - these powerful 3 to 7 minute clips will pull students in and teach valuable positive behavioral concepts. Each clip comes with follow up questions. 7 Tough Talks - these personal conversations with Keith contain titles like, “Suicide is a Bad Idea” and “The Power of Apology”. Each tough talk comes with follow up questions. Bully Proof Your Classroom - a workshop for educators. Bully Proof Your Child - a workshop for parents and guardians. Internet Portal - includes access to printable materials, anti bullying pledges, contracts, activities, and resource sheets. Booklet - contains complete instructions on how to use the kit as well as follow up questions. Keith and His team Can Design an Anti Bullying Campaign to Meet Your Needs. Use a combination of the kit and Keith’s live assemblies and workshops to create a custom anti bullying campaign for your school or district. 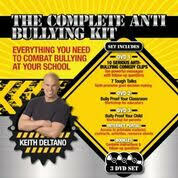 Keith can conduct live student assemblies, teacher workshops, and parent workshops and then the school can use the curriculum (The Kit) periodically in order to keep the anti bullying message prominent in the minds of the student body. Keith’s team will provide press releases as well as instructions on how to ensure a large turnout at the evening parent workshops and let the community know what you are doing to create a positive and inclusive environment at your school. Keith’s team will also provide tools and links for your school’s website that parents can use to monitor social media. Please spend some time on the site to learn who Keith is and what he does then contact us about kicking off and running a campaign in your school or district.